Since we started homeschooling, just about everything we do is learning-based. Sometimes, I have to get a little bit sneaky, since if I present everything as "learning" or "educational", not everyone will be interested, if you know what I mean. I am always looking for fun games, activities, etc. to help my boys learn, even if they don't know they are! For example, we have a whole folder on the iPad filled with logic games that the boys LOVE to play, but they have no idea that they are actually learning.. If they did, they probably wouldn't want to play anymore. That's just the way it goes! So, I've learned to get creative. When Thinkfun offered to send me their a-ha! Brainteaser kit, I jumped at the chance! I have always been a huge fan of Thinkfun and the fact that they can package and promote educational toys and make them fun and enjoyable for kids. The a-ha! 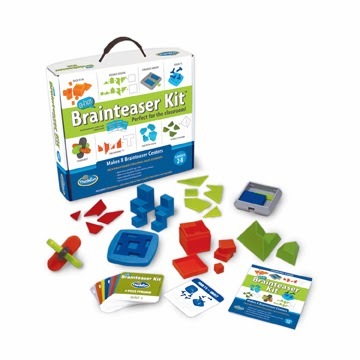 Brainteaser kit is designed especially for classrooms (mom classrooms included!) and it's a really awesome kit! This is a really great kit, plus it's affordable at only around $25.00. There are eight different brain teasers in all, and they are great for me to give one to Tater while we are getting our day started, or when I need a few extra minutes to get organized. He really enjoys working on these too, since they are hands on. He often does logic and brainteaser type worksheets, and he gets frustrated with them, but with this set, he really likes it because it is hands-on. I like that I can have something in my "bag of tricks" to pull out when we need a change of pace! Thanks, Thinkfun games! If you want to check out this, or any of their other awesome game and learning sets, check out their website HERE. You can also follow them on Facebook and Twitter so stay up to date with all the latest news and coolest products!